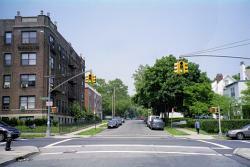 This is Brevoort Street (formerly known as Willow Street) looking north past Metropolitan Avenue. All of the houses along the right side of the street are still there, including the one in the foreground. The Kew Brevoort Apartments have yet to be built on the far left corner. The first house on the left is one we have seen before. It faced Abingdon Road, and has long since been demolished. Multiple dwellings now occupy the property. On the next page, the photographer has walked one block north on Brevoort Street to the intersection of Abingdon Road.